The greatest soccer player in history was born Edson Arantes do Nascimento, but everyone else knows him as Pelé. Despite not appearing on the pitch in many decades, Pelé enjoys a near-mythical reputation as the best player in the most popular sport in the world. 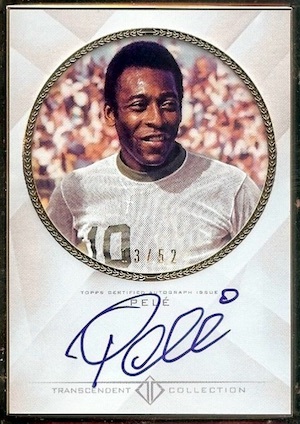 Thanks to his lasting legacy and inclusion in modern sets, Pelé cards and autographs remain in the forefront of the hobby and many of the key Pelé cards are in high demand. 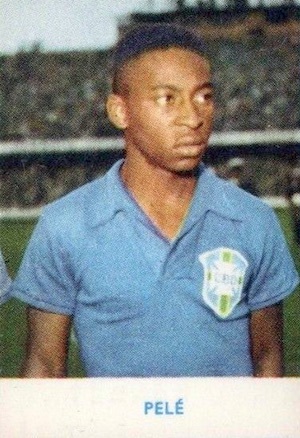 The Brazilian-born Pelé spent nearly his entire career making headlines for the Brazilian National Team and the Brazilian professional team, Santos FC. Similar to modern soccer talents, Pelé came to the United States at the end of his career. He joined the now-defunct New York Cosmos in 1975, and was responsible for a brief stateside surge of interest in soccer. Review popular Pelé card auctions currently on eBay. Outside of the past few years, there are not a ton of mainstream cards available for Pelé. The following list details some of the best options for Pelé card collectors across many budgets. While it is hard to definitively name one Pelé card as his true rookie card, the 1958 Alifabolaget is the among the top options. Several regional cards with low production lay claim to the Pele rookie card title, so it really just boils down to personal preference, budget and card availability. With a full-color image and appealing look, the Italian-made Alifabolaget is a great card, if you can find one. This early Pelé card remains popular despite oddball origins. 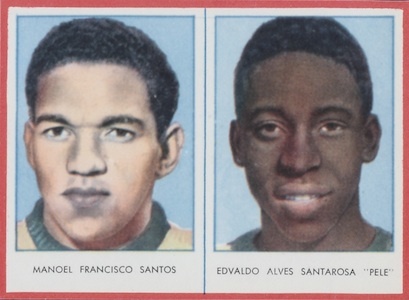 The dual "card" is actually cut from a Swedish magazine and normally includes Manoel Francisco Santos, although some are cut further to present the Pelé card solo. Due to its thin magazine stock and the fact that it is literally cut from a magazine, this is generally considered the least preferred of the options vying for rookie card status. One interesting note is that this card appears to feature Pelé's full name. However, upon closer examination, the card is attributed to "Edvaldo Alves Santarosa." Edvaldo Alves de Santa Rosa is actually the official name for the original Dida, a former Brazilian soccer star, who passed away in 2002. Another early card for the soccer superstar, the Quigol Pelé was made in Brazil, which does boost its appeal to many collectors. Several other cards printed in Brazil have emerged from around the same time, so again, it is hard to designate one as the true rookie. Despite some debate about when this card was actually printed and released, the Heinerle card remains a popular option among Pelé cards. This German-made card was either released in late-1958 or early-1959. 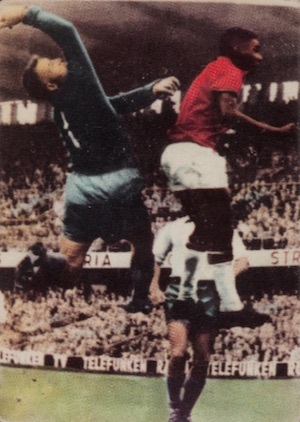 The deep-colored image shows a young Pelé going up for a header. The card back showcases a soccer figure watermark design in the background. The first option from a manufacturer that is familiar to most collectors, Panini released this Pelé card in 1964. With the full colors of Brazil on display, this is one of the more affordable early cards for Pelé, but it's hardly cheap. Panini released several other Pelé cards in the 1960s and 1970s. 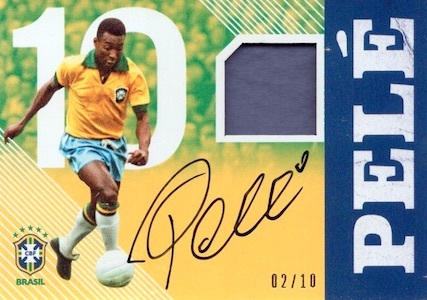 It was not until 2008 that collectors were treated to certified pack-pulled Pelé autographs. The former soccer great appeared in Sportkings Series B and C. Although the overall design is okay, the nondescript feel and small image of Pelé leaves much to be desired. The large on-card signature is a nice positive, however. There are six different base silver autographed versions. The first three, from Series B, are numbered to 25, and the last three, from Series C, are numbered to 20. There are also gold parallels of each card, which are all limited to 10 copies. Issued in 2013 Topps Allen & Ginter Baseball, many have questioned why a soccer star is pushed in MLB products. Superstar athletes tend to transcend their individual sports, and a strong design, on-card signature, and Topps brand power, make for a great Pelé collectible. 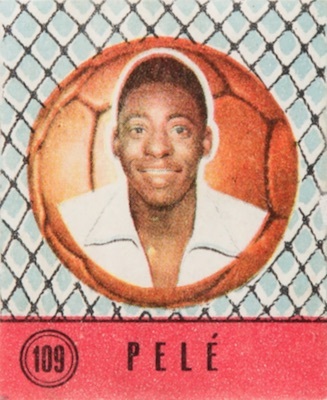 Those looking to spend quite a bit less can find Pelé in the base set with mini parallels. 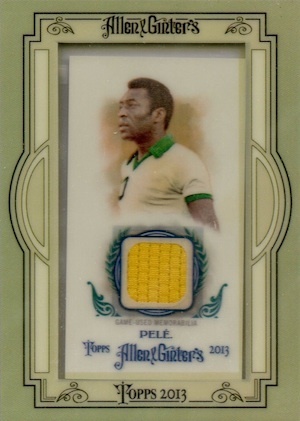 Also from 2013 Topps Allen & Ginter Baseball, the distinct A&G design is paired with a small jersey piece from Pelé. This is the best and most affordable option for collectors to obtain a piece, however small, from something that was worn by the greatest soccer player in the world. 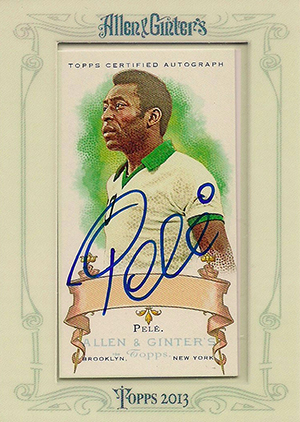 A&G is just one of several Pelé autographs produced by Topps over the years. Still, overall supply remains low despite multiple sets featuring the superstar's signature. Several of these are hard-signed, including cards found in 2013 Topps Tier One Baseball and the ultra-premium 2016 Topps Transcendent Baseball. Showcasing the former great in his familiar Brazilian jersey, this 2014 Panini Prizm World Cup Pelé card is appealing for many reasons and has added significance since Brazil was the home country for the 2014 FIFA World Cup. 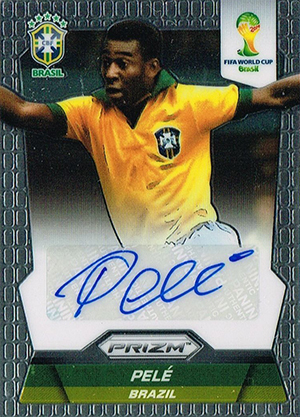 Pelé autographs were also featured in 2018 Prizm World Cup and Panini revealed that Pelé is one of the short prints that combine to average 1:19 cases. 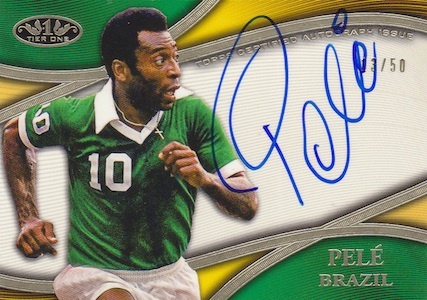 Of course, Prizm is not the only Panini brand with Pelé autographs. Out the various choices, 2016 Flawless Soccer is arguably the top option thanks to the high-end elements and limited run. Another popular signed card is found in 2017 Nobility Soccer and shown below. 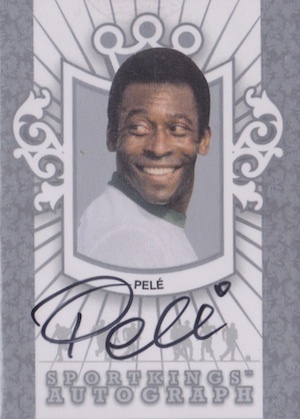 Yes, most of the multi-player Pelé autographs have sticker signatures, but man, what an awesome collectible. Offering the signature of the greatest of all-time with signatures for some of the other top players in the game, it is really hard to go wrong. Top pairings include Cristiano Ronaldo as well as fellow countryman Neymar. PELE #316 STICKERS - VERY RARE - YEAR? 1989 Flipp Tipps Pele 3 inch Button RARE!!! Pele in a Baseball set, what next, a Ice Hockey set? There are great Pele cards out there, most of these are not, this is basically an advertisement for Topps. While it may seem like a weird fit, these Pele cards in baseball sets are proving to be extremely popular. They’re also expanding the sport’s profile among collectors who might not be into it as much as these “baseball cards” are aimed primarily at North American collectors. The A&G relic may not be among the most valuable Pele cards out there, but it is his first memorabilia card that is readily available. All previous ones have been extremely rare (limited to 25 copies or less). You’re right, there are plenty of Pele cards out there and different lists will probably all look a little or a lot different. The author has a very good understanding of the sport and the popularity and importance of different cards. A Topps relic card of Pele just released, on your list, has plummeted to $9 – why? What year/season/game did this Pele jersey patch come from ? it does not say. How many of these cards made, 1,000s ? It does not say. Paul � You’re showing a Messi card. Kind of hard to compare. As mentioned in my previous comment, there are rarer Pele memorabilia cards that are also more valuable, however they’re extremely rare (less that 25 copies) so most collectors won’t even get a chance to get one. As a result, the A&G Pele Relic is important simply because it the only one that’s readily available, regardless of value. I am surprised that in the list of top 10 Pele cards you did not include any from the Titulares album. 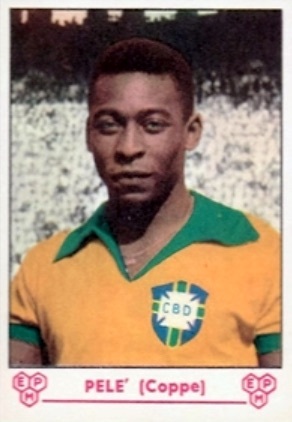 The Titulares cards were produced in Brazil and should be considered Pele’s true rookie cards and most wanted one’s. The card from the Rekord magazine, in my opinion, should not be included here since the name of Pele is incorrect. If any thing, it should be an error card from 1958. The top 10 and most wanted Pele cards are, hands down, are from late 50’s early 60’s. This article did not aged well. Fair enough. The brilliance of collecting is that we can all do it the way we want. I tried to highlight a mix of his cards from across the decades rather than just his earliest releases. Obviously, those 1950s and 1960s cards are important but that doesn’t mean they are the only cards of note.